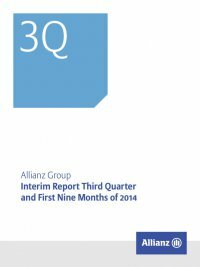 Interim Report Third Quarter and First Nine Months of 2014 Allianz Group36 ­revenue to rise between 4 % and 5 % in 2014 and 2015 (adjusted for for- eign currency translation effects). In the life sector, we expect premium growth to continue to recover. In mature markets, rising employment in some markets and a new product mix will help to support top-line growth. In emerging markets, strong growth will be mainly driven by rising incomes and social security reforms, boosting demand for pension products. Financial market developments should support demand, too, as con- sumers increasingly ask for more sophisticated savings products beyond bank deposits. All in all, we expect that global premium rev- enue will rise in the 3.5 % – 4.5 % range per annum in 2014 and 2015 (adjusted for foreign currency translation effects). With interest rates remaining at low levels, companies will con- tinue to adapt their business models to the challenging environment. Besides a stronger focus on the protection business – including health – new and more flexible guarantee concepts are set to come to the forefront in the savings business. At the same time, insurers will continue to look for new, long-term investment opportunities, paying special attention to infrastructure investments. These adjust- ments,alongwithstrongcapitalbuffers,leavetheinsuranceindustry well placed to cope with more stringent capital and reserve require- ments. Asset management industry outlook Increasing asset valuations for equities and decreasing bond-yields in developed markets have provided a tailwind for the asset manage- ment industry in the first half of 2014. The third quarter of 2014, how- ever, was a period of consolidation, with a lowering of global growth expectations and political uncertainties coming to the fore. Discus- sions around central bank policies, in particular in the United States and Europe, were an additional source of uncertainty. The develop- ment of regulatory activities – particularly in the consumer protec- tion and transparency fields – is an additional source of uncertainty for the asset management industry. Equities have shown some volatility in recent months and with investors anticipating an increase in U.S. interest rates we expect this instability to continue. The dollar rapidly strengthened and reached its strongest level in more than four years. Interest rates, however, have continued their downward trend. Nevertheless, if the longer- term trend is towards higher interest rates – especially in the United States – coupled with global demographic developments, then bonds should become more attractive. This holds true in particular for lia- bility-driven investors and for the growing number of retirees in the developed world looking for a stable stream of income. A continuation of improving economic conditions, in particular in the United States, as well as trends in client demand, still represent a positive environment for further asset management industry growth. At the same time, industry profitability is expected to remain challenged as asset flows into passive products and growing expenses from higher distribution or marketing costs put pressure on operat- ing margins, and the effects of increased regulatory oversight and reporting take their toll. In such an environment a money manager’s ability to grow is dependent on providing innovative client-focused investment solu- tions, delivering above-benchmark investment results, offering com- prehensive investment products and services, its ability to prudently and holistically respond to client needs and upping the scale and efficiency of operations. Outlook for the ­Allianz Group We are confident about staying on course in the last quarter of this year. The upper end of our operating profit target range of € 10.0 BN, plus or minus € 0.5 BN, is in reach. However, as we witnessed in 2013, unfavorable developments in the business environment can have adverse impacts on aspects of our performance. It would therefore be inappropriate to simply annualize the current nine month’s operat- ing profit and net income to arrive at an expected result for the full year. As always, natural catastrophes and adverse developments in the capital markets, as well as factors stated in our cautionary note regardingforward-lookingstatements,mayseverelyaffecttheresults of our operations. Cautionary note regarding forward-looking statements The statements contained herein may include prospects, statements of future expectations and other forward-looking statements that are based on management’s current views and assump- tions and involve known and unknown risks and uncertainties. Actual results, performance or events may differ materially from those expressed or implied in such forward-looking statements. Such deviations may arise due to, without limitation, (i) changes of the general economic conditions and competitive situation, particularly in the ­Allianz Group’s core business and core markets, (ii) performance of financial markets (particularly market volatility, liquidity and credit events) (iii) frequency and severity of insured loss events, including from natural catastrophes, and the development of loss expenses, (iv) mortality and morbidity levels and trends, (v) persistency levels, (vi) particularly in the banking business, the extent of credit defaults, (vii) interest rate levels, (viii) currency exchange rates including the Euro/U.S. Dollar exchange rate, (ix) changes in laws and regulations, including tax regulations, (x) the impact of acquisitions, including related integration issues, and reorganization measures, and (xi) general competitive factors, in each case on a local, regional, national and/or global basis. Many of these factors may be more likely to occur, or more pronounced, as a result of terrorist activities and their consequences. No duty to update The company assumes no obligation to update any information or forward-looking statement contained herein, save for any information required to be disclosed by law.